生命科学 2018, Vol. 30 Issue (2): 222-232. DOI: 10.13376/j.cbls/2018029. 石嵘, 韩卫东, 洪微. 国家自然科学基金资助非编码RNAs与肿瘤研究. 生命科学, 2018, 30(2): 222-232. DOI: 10.13376/j.cbls/2018029. SHI Rong, HAN Wei-Dong, HONG Wei. Survey of research on non-coding RNAs in oncology funded by National Natural Science Foundation of China. 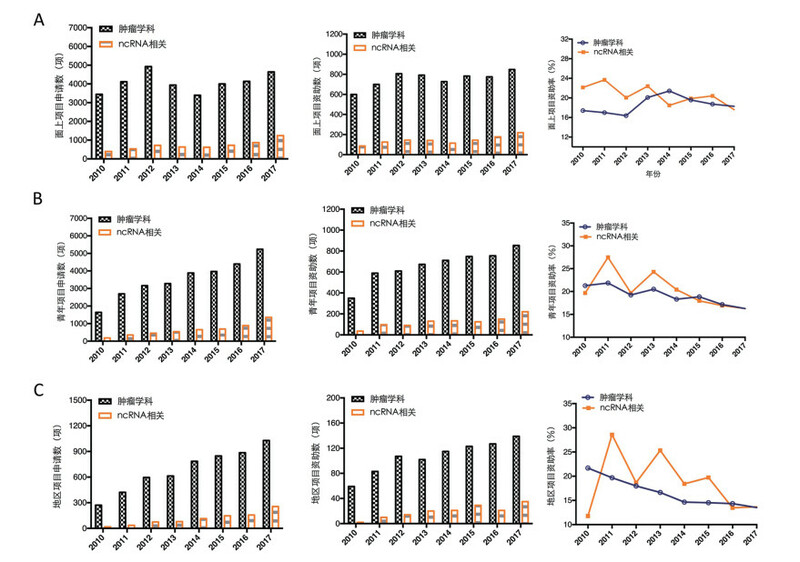 Chinese Bulletin of Life Sciences, 2018, 30(2): 222-232. DOI: 10.13376/j.cbls/2018029. Abstract: This paper summarized the grant applications and supports on non-coding RNAs (ncRNAs) in the Division of Oncology, Department of Health Sciences of the National Natural Science Foundation of China (NSFC) from 2010 to 2017. The current situation and development trends with the support of the NSFC funds in the field of ncRNAs and cancer research were studied. The frontiers of science and the existing problems related to ncRNA researches in the field of oncology were analyzed. Morris KV, Mattick JS. The rise of regulatory RNA. Nat Rev Genet, 2014, 15: 423-37. 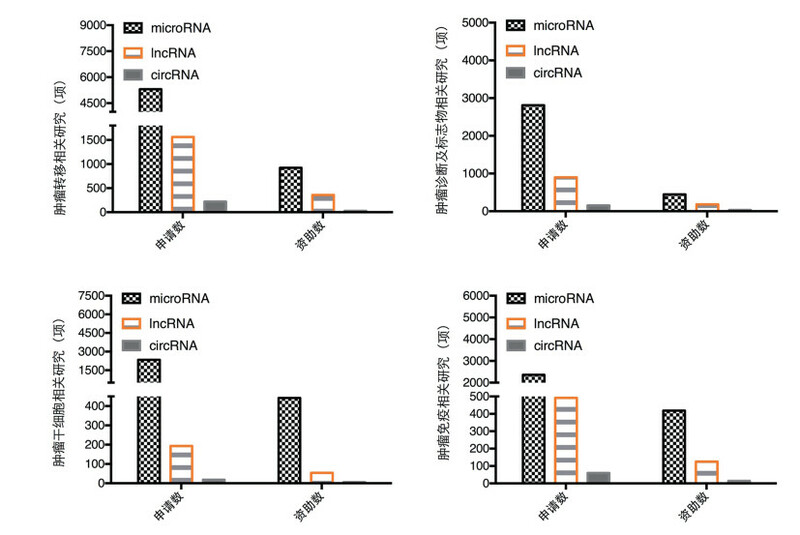 Pritchard CC, Cheng HH, Tewari M. MicroRNA profiling: approaches and considerations. Nat Rev Genet, 2012, 13: 358-69. Mercer TR, Gerhardt DJ, Dinger ME, et al. Targeted RNA sequencing reveals the deep complexity of the human transcriptome. Nat Biotechnol, 2011, 30: 99-104. Calin GA, Liu CG, Ferracin M, et al. Ultraconserved regions encoding ncRNAs are altered in human leukemias and carcinomas. Cancer, 2007, 12: 215-29. National Natural Science Foundation of China. Project guide of national natural science foundation of China in 2017: Beijing: Science Press, 2017. Panda AC, Grammatikakis I, Munk R, et al. Emerging roles and context of circular RNAs. Wiley Interdiscip Rev RNA, 2017, 8: e1386. Li J, Yang J, Zhou P, et al. Circular RNAs in cancer: novel insights into origins, properties, functions and implications. Am J Cancer Res, 2015, 5: 472-80. Byron SA, Van Keuren-Jensen KR, Engelthaler DM, et al. Translating RNA sequencing into clinical diagnostics: opportunities and challenges. Nat Rev Genet, 2016, 17: 257-71.